According to statistics on the FiinPro® Platform, as of October 24, 1818, 449 enterprises listed and traded on HOSE, HNX and UPCOM have posted earnings of 9M/2018, of which 86% of enterprises reported profit. - Total net profit in 9M2018 of 449 companies was VND70 trillion, increasing 31.1% YoY, completing 82% of the year target. - Top performers in 9M/2018 were AMV (9,370%), SRA (4,477%), SMA (3,483%), MBS (822%), VHC (152,1%), ACB (147%), VIB (175%). - 69 companies (20%) already completed 2018 target in just 9 months, including AAM (227%), GAS(128%), VHC (167%), DPM (148,3%). - By sector, oil and gas, food and beverages, banking, financial services and real estate sectors saw the highest growth in the first nine months of 2018 compared to the same period of 2017, although the growth momentum by quarter by quarter slowed down. - The banking sector has always been the market leader, there have been 11 banks announcing their Q3/2018 and 9M2018 earnings, their combined net profit grew 49% YoY. - Top performers were VIB (175%), ACB (147%), TPB (109%). - Outstanding loans in 9M/2018 of these banks rose 12.1% year to date of which TPB up 16.2%, VCB up 15.1%, and VIB up 13.6%. - Non-performing debts trend up in Q3, for example, MBB’s non-performing debts rose from 1.28% in Q2 to 1.57% in Q3, VIB’s non-performing debts rose from 2.33% in Q2 to 2.5% in Q3, VPB’s up from 4.07% in Q2 to 4.7% in Q3, VCB’s up from 1.15% in Q2 to 1.18% in Q3 and ACB’s up from 0.78% in Q2 to 0.84%in Q3. 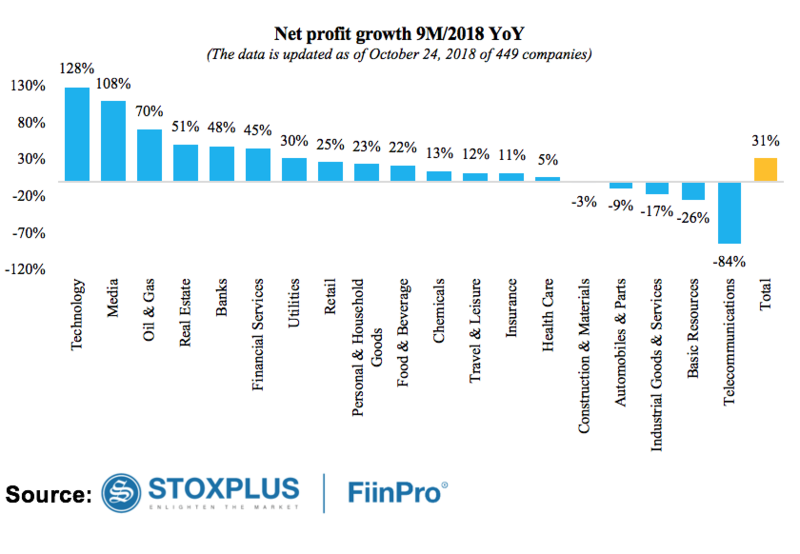 - EPS growth in 2018: Speaking at FiinPro Talk 7, Nguyen Quang Thuan, CEO of StoxPlus said “ The banking sector is forecasted to continue to grow well despite the fact that banks are unlikely to reach a 17% credit growth cap. FiinPro data shows that analysts have the most optimistic view, forecasting the banking sector's EPS forecast to increase 42.1% by the end of 2018, while bank executives are more cautious with a forecast of 35.7% and StoxPlus’ forecast is 29.9% increase”. - Food and beverage saw a net profit increase of 987 billion, contributing 1.7 points to the market, including CMX (263%), ANV (254%), ABT (251%). and VHC (153%). Especially, 8 out of 10 enterprises having the highest growth rate in this sector are in aquaculture and agriculture. In this respect, the US-China trade war is having a positive impact on the aquaculture industry in Vietnam. Please visit FiinPro® Platform for more details or download data here.